Spinning classes are indoor group cycling sessions involving the use of an indoor stationary bike with a weighted flywheel and base. Spinning classes emerged as an up and coming fitness trend in the early 1990s. Riding the wave of the 1980’s development of the modern fitness culture, Johnny Goldberg, a professional cyclist, sought an all-season option to training. Subsequently, the creation of the present-day indoor cycling bike unfolded. 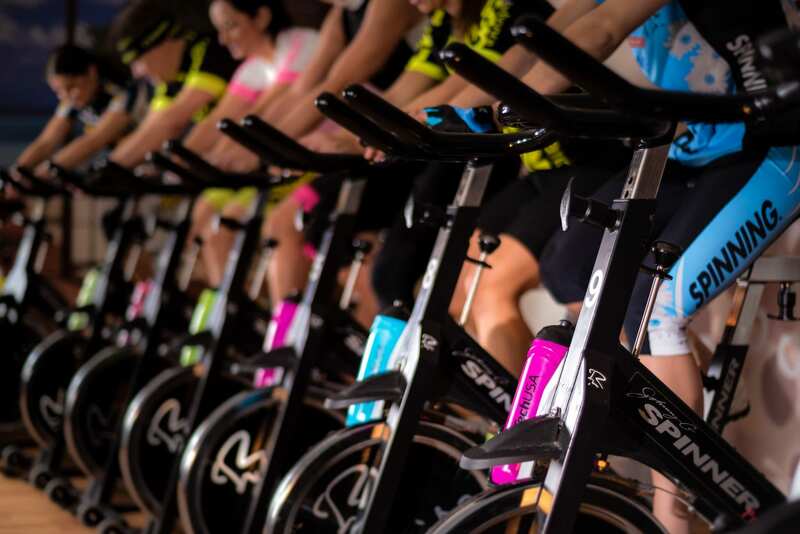 Since then, countless indoor spinning studios have opened worldwide. With often packed classes, a typical session consists of interval tracks, uphill races, and varying speeds and resistances. You choose your level. Each rider controls their resistance, making it a feasible option for any fitness level. Upbeat and energetic playlists set the pace and encourage participants to challenge themselves. It is low impact. Unlike running or jumping sports, cycling is easy on the joints. Whether you are recuperating from an injury or want to prevent wear and tear on your joints, spinning offers a great cardio alternative. It makes your cardiovascular system work. Cardio activity is any activity that increases your heart rate. Most national health departments recommend 150 minutes of moderate to vigorous cardiovascular activity every week. Cardio activity reduces the risk of heart disease, helps to maintain a healthy weight, improves mood, decreases stress, and increases energy levels. Spinning can help you reap these benefits and meet the recommended quota. At Bodhi Cycle, each class is one hour, including 45 minutes of high-intensity cardio, and can burn upward of 500-1000 calories. Spinning can increase your muscular and aerobic endurance. Endurance involves your body’s ability to handle stress and force on the muscles over an extended period. Indoor cycling targets the glutes and major muscles of your legs. It tones and builds these muscles, as well as ups their endurance capacity. What can you expect as a first-timer? Arrive 5-10 minutes early to make sure your bike is adjusted correctly. The proper seat height position is high enough so that your feet comfortably reach the pedals. At the farthest range, you want to make sure your knee still has a slight bend and is not locked. The handlebars can move forward and backward, as well as up and down. Throughout your ride, you want to maintain a proper posture and open chest. Your shoulders should remain back and down, with a slight bend in the elbows. If you are unsure, our Bodhi Cycle instructors would be happy to help you make the appropriate adjustments. Just ask! Expect to have fun! You might feel silly the first time or off-beat – that’s okay! It takes a few classes to get your stride down. Challenge yourself, but stick to your fitness level. It takes time to find your rhythm. Energize your mind and free your soul! Nosara, Costa Rica offers the ultimate oasis. Located in the foothills of the Nosara district along the Nicoya Peninsula, Bodhi Tree Yoga Resort provides an escape from the everyday hustle. With the ocean only a short walk away, our resort in Costa Rica presents the perfect balance between rugged jungle terrain and untouched beaches. The vibrant culture and environment promote optimal spiritual and physical well-being. Get back in touch with your soul and embrace the country mantra, Pura Vida (Pure Life)! Yoga, surf, and cycle in paradise. Book your class with one of our motivational and enthusiastic instructors today! Come ride with our team at Bodhi Cycle.